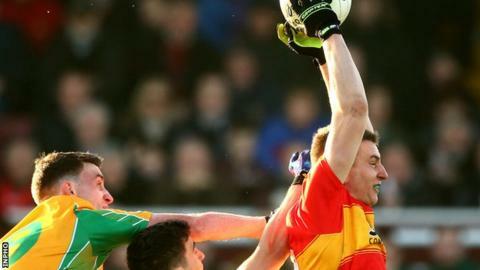 The GAA's annual congress in Carlow has voted to introduce the 'mark' to gaelic football although it is not clear when the new rule will come into effect. The rule change, which was passed with 68% support from delegates, is aimed at increasing high fielding in the game. Under the new rule, players will have the option of calling for the mark if kick outs go beyond the 45-metre line. Also on Saturday, motions to move All-Ireland Finals to earlier in the year and scrap replays were defeated. The earlier finals motions was backed by a majority of delegates but the 60.8% figure was under the necessary two-majority. On Friday night, GAA bosses opted to withdraw the motion calling for the establishment of a new All-Ireland B Championship for Division 4 teams. The proposals had led to an outcry from the weaker counties and the GAA had little option but to withdraw the proposal. A motion to replace the Under-21 inter-county football championship with an under-20 grade from 2018 was passed. The minor grade, currently played at under-18 level, will also be changed for under-17 from 2018.